At CopenhagenizeDesign Co. we certainly trust bicycle users' abilities to ride on the safest, easiest and quickest routes. The key to our Fixes is almost always found in our observations of the Desire Lines of the bicycle users and their behavior. We firmly believe that before redesiging the street the intersections on either end must be fixed. Here are our proposals. To redesign this intersection we will use respect the Desire Lines of the bicycle users who use it. We'll propose changes to the infrastructure to maximise the safety of the intersection and make the wayfinding more clear. 1. For bicycle users leaving Værnedamsvej a usual Copenhagen Left is unnatural, causing bicycle users to make a direct turn. This seems a safe route, but could be better communicated to motorists. 2. The end of the Svanholmsvej is narrow, causing a lack of space for the waiting bicycle users. We propose rearrangements mostly based on the traditional painted bicycle lanes in order to organise the intersection. 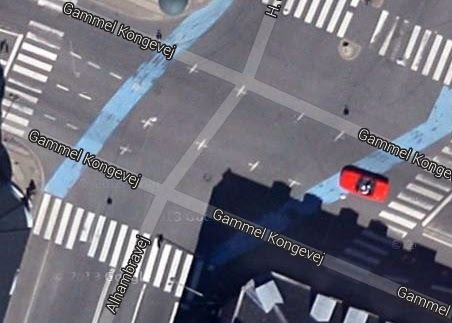 Further down at the junction between Gammel Kongvej and Alhambravej, a blue lane has been painted on the ground to encourage cyclists to make a safe Copenhagen Left. Here, on Værnedamsvej, without questioning the classic and specific way to turn left at an intersection, we prefer to accept the fact that bicycle users turn directly. Indeed, based on our observations, 0% of cyclists make the two-stage turn. Moreover, we noticed that bicycle users have a tendency not to wait on the right side on the street, since they know that no cars can turn in the street. So they wait at the traffic light in the middle of street ready to turn left. In order to improve the relation between the cars and the bikes, we suggest to create a bike box in front of the traffic light. We're not a big fan of bike boxes, but this is one situation where it will work. Bicycle users will have the priority over the cars and will start turning at the intersection before them. This infrastructure is not usual in the streets of Copenhagen except at some T-intersections, but here it a way to replace the two-stage left turn. 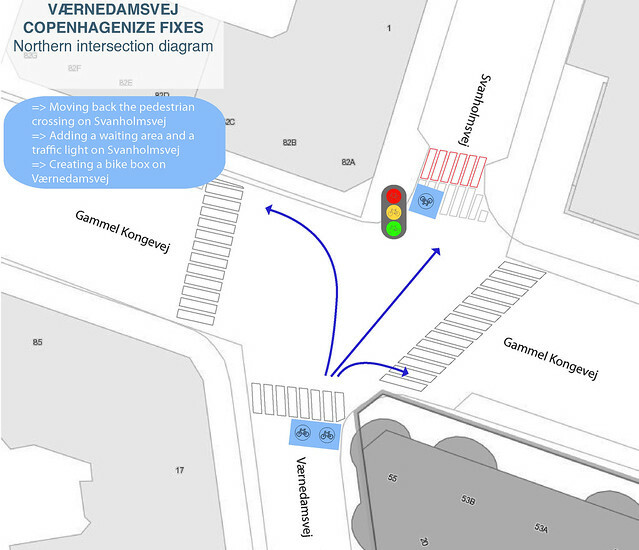 Regarding the bicycle users waiting at the corner of Svanholmsvej and Gammel Kongevej, moving the crossing back and creating a waiting area can be a solution to make space for them. Slightly reducing the extension of the pavement at the corner is a way to find space. But it is the one-way street, so this solution implies that a traffic light dedicated to the bicycle users is added. Currently, they use the pedestrian signals on the other side of the street to figure out when they can cross the intersection. It's a bit of a dodgy situation. Creating a cycle track heading north to south on Svanholmsvej is a solution. This would involve removing the car parking on the left side of the street and it must be analysed at the scale of the district. At the intersection between Værnedamsvej, Vesterbrogade, Frederiksberg Allé, it is atypical that so many cyclists use the cross walk and the sidewalk. We can consider this behaviour as a sign pointing out that this intersection does not meet cyclists' needs. Actually, the Desire Lines' observation shows that this intersection is not at all designed for cyclists leaving Værnedamsvej. 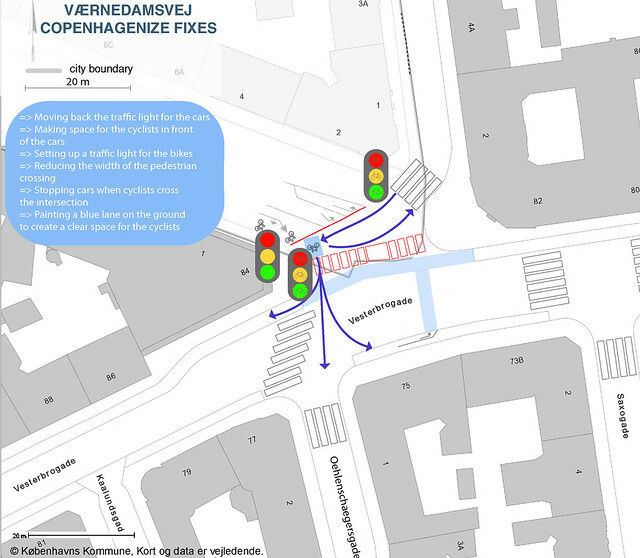 The main issue is to design an intersection that allows the cyclists turning right on Vesterbrogade and crossing it. Setting up a traffic light for bikes at the end of Værnedamsvej and another one at the end of Frederiksberg Allé. These traffic lights will turn green for the cyclists in the same time as the light dedicate to the cyclists on Vesterbrogade, when all the traffic lights for the cars are red. It's possible to paint a blue lane on the ground between the traffic light on Værnedamsvej and the one on Frederiksberg Allé in order to create a clear and official lane for the cyclists. Currently, we can not disregard the fact that 41% of the cyclists leaving Værnedamsvej use this space. Because of the complexity of this intersection a temporary solution tested during a few months while Municipalities analyse the behaviour of the cyclists, pedestrians and car drivers may be required.